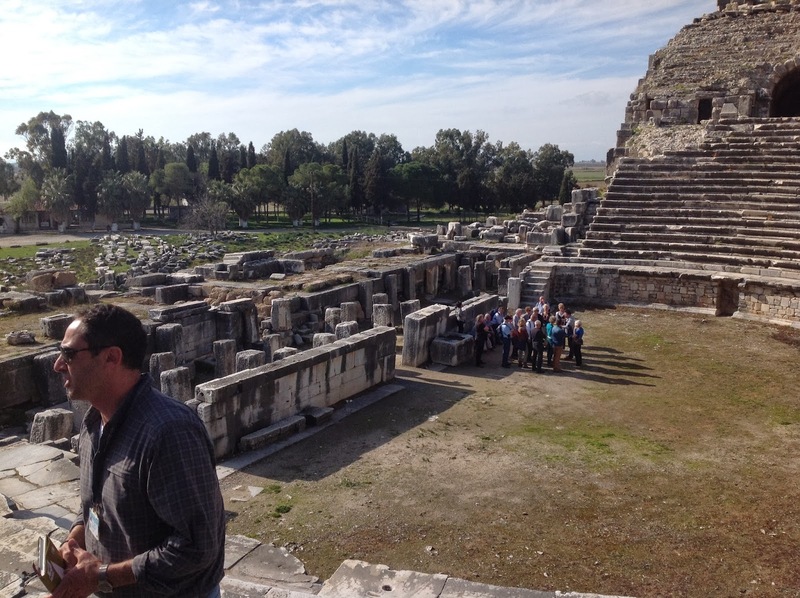 Let me wrap up my account of our travels in Turkey with a report on our last two days in and around Ephesus. Ephesus has a triple distinction. First, it was important to Saint Paul, who spent a fair amount of time here, addressed one of his precious letters to this church, and who very much wanted to visit with the church a last time before returning to Jerusalem, where he faced a very uncertain future. 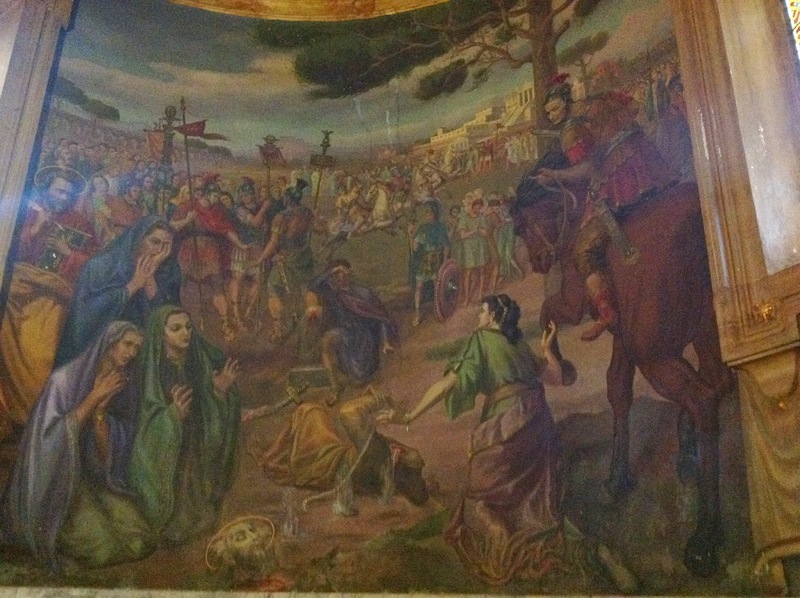 Second, it was important to Saint John, for two reasons: he addressed comments to this church in his Apocalypse; and second, it was here he brought the Blessed Mother. John was buried here. And so, Ephesus' third distinction is as the home of our Lady, perhaps even to her death (unless, as one tradition attests, she returned to Jerusalem and died there). Enough chit-chat, let's see some pictures. 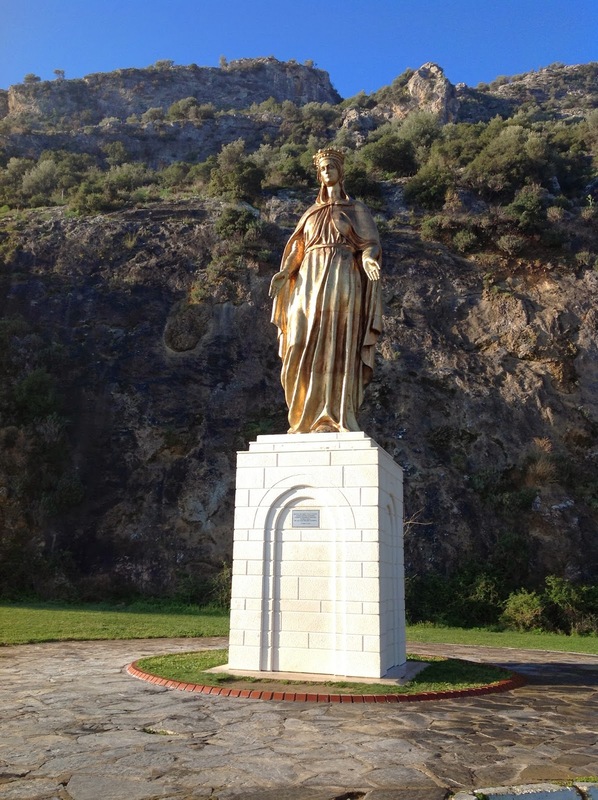 Here's a lovely statue of our Lady that greets you as you drive up a small mountain to her house. This was made possible by the American Society of Ephesus, the project of a gentleman from our Archdiocese: George Quatman. A copy of this statue graces the campus of Lehman High School in Sidney, Ohio. Mary's House. This structure was built many centuries later, but the foundation dates to our Lady's time. No photographs are allowed inside, but it is a chapel now. Very peaceful. This is an amazing sight, once you realize what you're seeing. First, on the right, is a spring of water; it's potable. I had a sip. But what's on the left is what is astonishing. Earlier in our trip, we came upon some trees with strips of paper tied to the branches, and we wondered why. 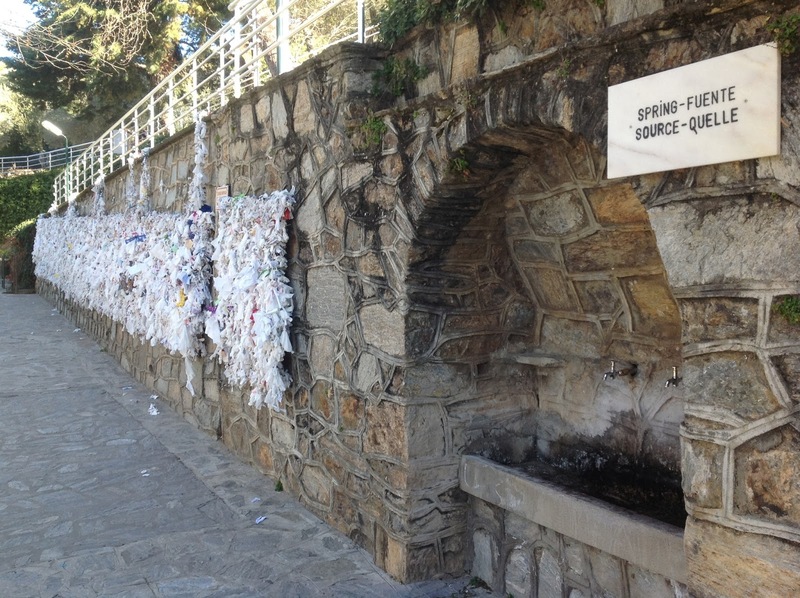 Our guide explained that it is a custom of Turkish people to tie prayers in this fashion, originating in paganism, but carrying forward with Muslims. See all those strips of paper? Those are likely to be mostly Muslim prayers...at Mary's house. This is the theater in Ephesus. You can read what happened here -- here! -- with Saints Paul and Luke, in Acts 19. It's gripping story. The city was filled with confusion, and the people rushed with one accord into the theater, seizing Gaius and Aristarchus, the Macedonians, Paul’s traveling companions. Finally, the very cool-headed "town clerk" came forward, and in effect told the crowd, knock it off! Do you want the Romans to come here? At this point, I can't illustrate the rest of our investigation of these sites with pictures, because my iPad ran out of juice. Which is too bad, because after this, we visited the ruins of the basilica erected here, and which is famous for being the site of the third ecumenical council, at Ephesus, in AD 431. This was the council that condemned the errors of Nestorius, and affirmed the true humanity and divinity of our Savior by affirming Mary the theotokos: God-bearer, or as we usually say, Mother of God. The whole population of the city, from earliest dawn until the evening, stood around in expectation of the council's decision. And when they heard that the author of the blasphemies had been stripped of his rank, they all began with one voice to praise and glorify God. When the bishops came out of the church, the people led them in torch-light parades, swinging incense, and singing, "Praised be the Theotokos!" 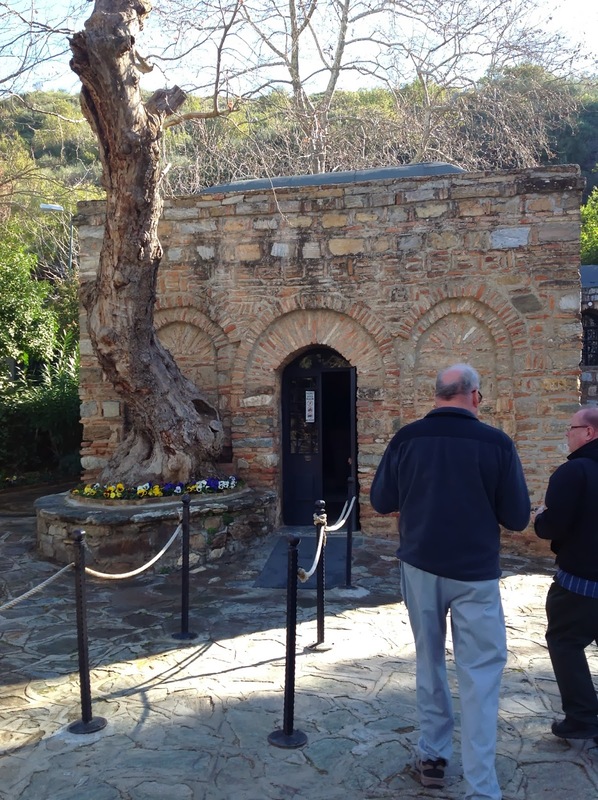 A little later, we visited the site of a basilica erected in honor of the Apostle John. At one time, it was one of the largest churches in Christendom. Now it is a ruin. 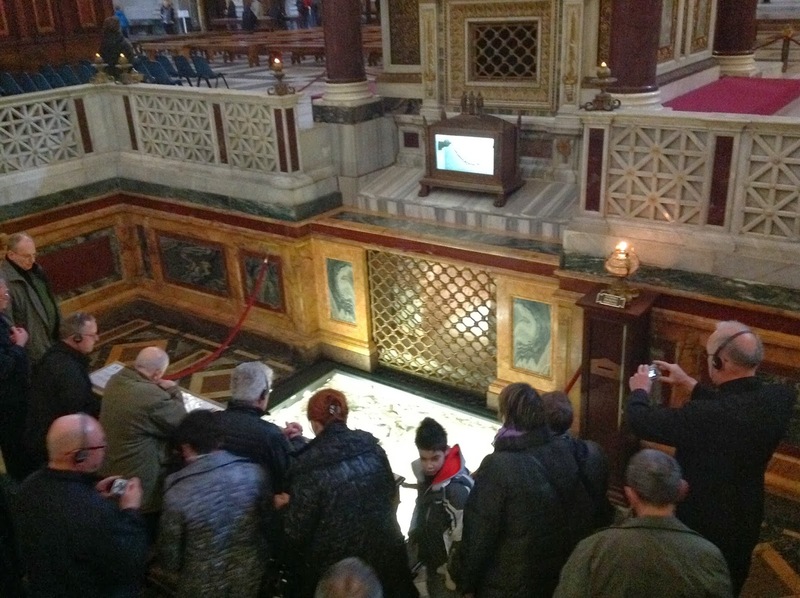 The grave of the apostle is there, and it's marked; but his remains are not there. We also stopped to see how Turkish rugs are made and view some of the rugs; but I regret I got no good pictures there. Sorry about that! Since I was focused on my passport, already out of my mouth was "thank you." But I didn't want that to be my response to his second comment. All I could think to say was, "God bless you." Well, you can imagine many of the things I thought of, later, to say -- but it was too late. Scripture says, don't worry what you say, the Holy Spirit will prompt you. Perhaps, in my case, the Holy Spirit was preventing me from saying any of those other things I thought of! As I say, I'll let you imagine. But as you can guess, I was pretty frosted about that. There's no doubt he said that precisely because I was dressed as a priest. That said, I want you to know that that -- on our last day -- was the first, and only, adverse thing that happened to us because we were Christians. It won't keep me from returning, and I hope it doesn't keep you from going. But if you go -- and I hope you will -- realize that the Turkish government is hostile to Christianity, despite all attempts to present a different front. 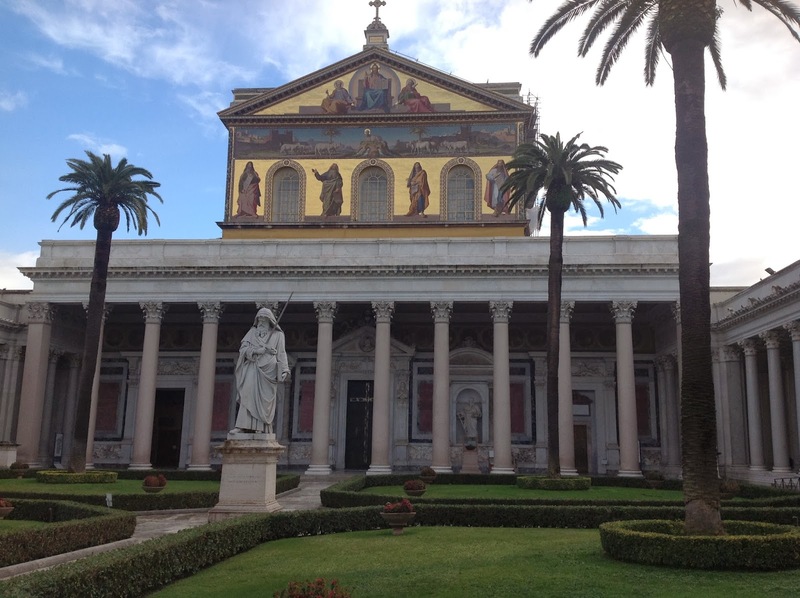 Let me close out my pilgrimage with Saint Paul by returning to two sites we actually visited, here in Rome, before we left for Turkey: first, the church on the site of Paul's martyrdom, and then the place where his body remains to this day. Here's a view of the church as we were walking toward it. You can't tell, but there are two other churches nearby: on the left is a church used by the Benedictine monks who take care of this site; and on the right, a small church whose reason for existence I can't recall just now. But how Roman! Why have one church on a holy site, when you can have three? Here's a painting in the sacristy of the church. If you look closely, you can see something a bit gruesome: Paul's head, after it's cut off, bouncing three times. And the result is three springs, giving the site its name: Tre Fontana. You will also see the artist included another tradition: that when Paul's head was severed, what came forth was not blood, but milk. 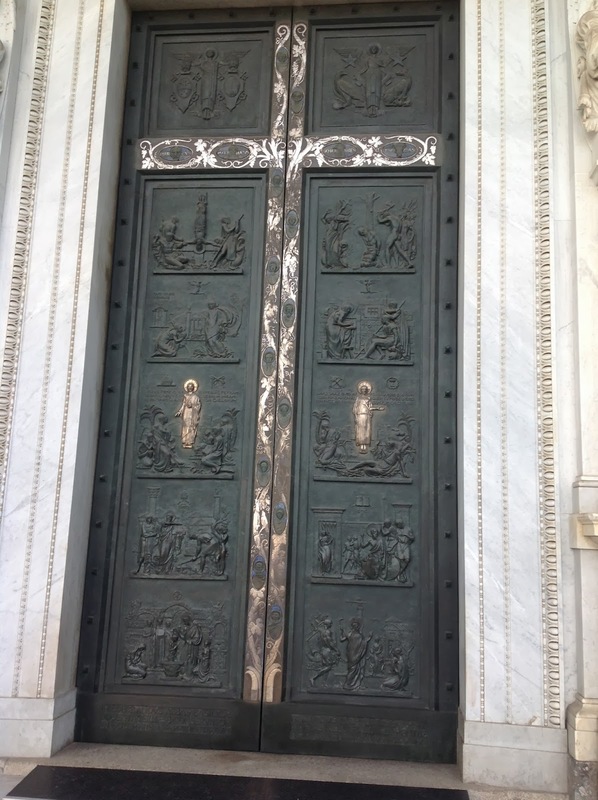 And here are the great doors of the basilica. Note they tell the story not only of Paul, but Peter; and though you can't see it in the picture above, Peter is in a niche on the left of the front of the church, balancing a statue of Paul on the right, which is visible. And, yes, that's Paul also in the center of the courtyard. And here is where Paul's bone lie -- under the high altar. You may wonder, how do we know these are Paul's very bones? Well, there's no absolute proof -- such as a copy of his will; but a test of the contents of the grave reveal human remains that date to the time. And the place has always been venerated as his grave. Someone from his time is buried there. 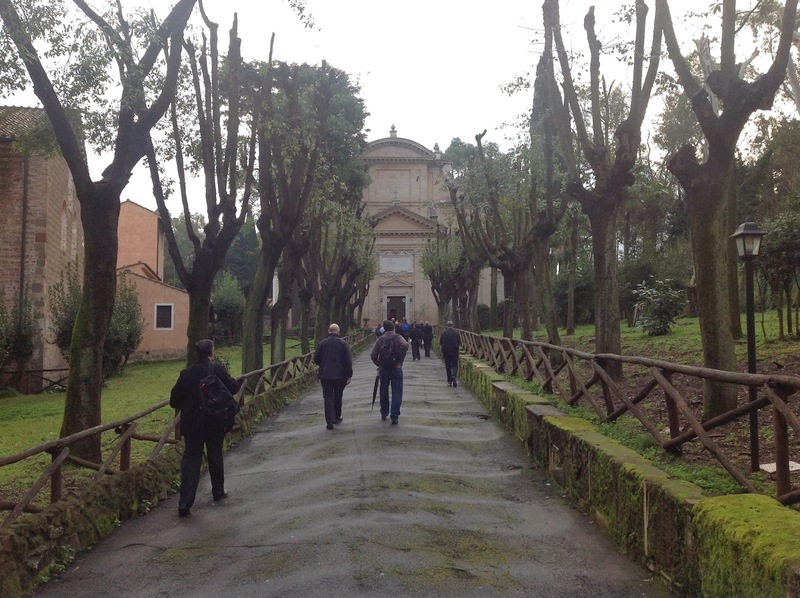 Cardinals flock to Rome -- and I'm there!